When I passed through Nordstrom last week looking for a fragrance to review, I sprayed on some Blumarine Innamorata and liked its peppery freshness chased by warm, chewy benzoin. A decent department store perfume! I snagged a sample and emailed Robin that I wanted to review it. Four wearings later, and I don’t know what possessed me. To me, Innamorata is the sort of perfume that inspires others to say they don’t like fragrance. It’s the perfume that leaves you mystified: how did a company presumably aiming to launch a money-making fragrance choose something neither sophisticated nor easy to love? Worse, it’s the perfume that mimics bees loose in your skull, trying to escape through your nasal passages. It’s my own fault for choosing Innamorata to review, and I don’t want you to suffer through another thumbs-down post without getting a little something out of it. So, not only will this review examine Innamorata, we’ll also look at what makes a fragrance annoying. I hope you’ll comment with your own thoughts on what defines an annoying perfume. I find one of the hallmarks of an annoying fragrance to be that it leans too heavily on its upper register. Do you know what I mean? It feels like all piercing violins and no bass. Innamorata is shrilly aldehydic without the juicy citrus to give the top body, despite the bergamot, mandarin and grapefruit flower listed in its notes. Its weak floral body doesn’t balance its hot, wheezy kick-off. Innamorata burns instead of sings. Innamorata’s high notes persist as it wears. Soon they’re joined by clean musk and an ozonic note, giving it a bit of a shampoo-fresh smell. Benzoin warms up the composition, but it still smells a bit like when I wash lingerie by hand and add a sample vial of perfume to the laundry soap. Another aspect of a fragrance that makes it annoying is when it doesn’t meld somehow with its wearer. I think a perfume that succeeds connects with the person wearing it by extending from the smell of her skin or from her character and style. Innamorata sits on my skin like a cheap dress. The color and fit are all wrong. As with well-chosen clothing, a good perfume doesn’t draw attention to itself, but to its wearer. It’s only with attention that someone in your company can pull the thread of your fragrance from your entire presence. Not so with me and Innamorata. It has that dreaded “perfumey” quality. The thing is, I’m not quite sure who Innamorata would fit well. All this said, Innamorata may sell like hotcakes. Who knows? Enough perfume buyers are swayed more by advertising than by the actual smell of the fragrance to be talked into taking home a bottle. It’s not that Innamorata is awful. It’s just mediocre, and mediocre can quickly become irritating. I have to think that rather than true love, Innamorata will only prove to be infatuation. For me at least, Innamorata would be impossible to live with in the long run. 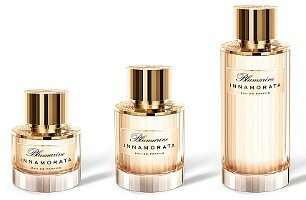 Blumarine Innamorata Eau de Parfum comes in 30 ml, 50 ml ($70) and 100 ml ($95) and in matching body products. Right now in the United States, it’s available only at Nordstrom. Pity, because it looks like a nice bottle! It sounds like it smells shrill – giving me a case of synesthesia! Reading the notes I was thinking that pineapple would fit in well – and pineapple for me is the hallmark of an irritating fragrance. What I find interesting though, is the 360 degree turn you did on it. I wonder what accounts for the instant attraction, followed by the lo-o-o-ong years of regret? I mean, supposing you had bought it, or married him, or whatever! I guess it’s another strike against impulse buys. I’m not sure why it first smelled so promising on me. I wondered if it was because I sprayed from the tester’s large atomizer instead of the tiny sample, but even when I drenched myself in it I didn’t get that first lovely citrus-benzoin hit. Oh well. Impulse buys and impulse elopements! At least getting rid of the perfume doesn’t require legal help! Shrill perfumes are quite annoying, though I don’t seem to have the problem of finding many shrill scents on my skin. Maybe this is a skin chemistry thing, but for me any scent that relies to heavily on vanilla-musk or white musk is the epitome of an annoying scent. Like a too loud baseline that overwhelms you with its reverberating presence rather than giving a song a fun beat. The weird thing is that scents that bill themselves as being a pure white musk scent like The Body Shop’s White Musk don’t annoy me as they seem rather soft, but when it’s mixed into a composition it’s a bully that dominates everything else. Weird. My skin seems to amplify this note to the point where several scents with this base smell similar on me because it is these base notes that take over the rest of the composition in about 30 minutes of application. Vanilla musk or that Coty-type musk can definitely take over a perfume if they get the chance. For me, they’re less shrill than boring. At first I think they’re comforting, then I just plain get tired of them. You describe it perfectly, Angela: ” bees loose in your skull, trying to escape through your nasal passages”. That pinging sensation in the sinuses is very annoying and yes, it’s in the high registers. For me, violet flower is often a culprit, and there’s nothing worse than screechy fruit. Lately I find the disconnect between what a perfume says it is and how it feels annoying – all these “noirs” that are anything but. To be honest, I’m very tired of elaborate perfume backstories in perfumes at all price ranges. I read them because I want to get an idea of what the notes are and yes, I’m interested in what a perfumer is inspired by…to a point. It’s usually the company funding the perfume that has the “vision” after all, and that vision is generally fields full of dollar signs. Lastly, I find it annoying when perfume outlasts it’s welcome, burning through the top and middle so fast you almost miss them, then settling into that pervasive musky/woodsy drydown that lingers on and on. Then count us both as crabby! I agree with every word you wrote. Yup. You articulated my thoughts nearly spot on! Especially regarding burning through the top notes (especially when they’re thin to begin with) and instead of developing, it just sort of peters out into musk/woodsy nondescript base notes. And I choose to embrace my crabbiness today! You just described so many new fragrances that I shake my head at. What is it about that shrieking top plus the scratchy musky-woody drydown? Yes. Although I find most of them boring individually, the great numbers of them become annoying after a while. It’s like that quote, “Water, water everywhere, but not a drop to drink!” We are lost in a sea of mediocre, boring perfumes, without the satiety of a real thirst-quenching fragrance! Only on NST would we have a reference to The Ancient Mariner in comments to a perfume review! It did not agree with me. It sounded very sharp on my skin and quickly melted into fabric softener, so I passed it without regret. The bottle is lovely though. Still, it’s a shame, all those lovely Italian offerings from this year: Valentina, Signorina, Inamorata, and all did not do anything for me. You describe Inammorata well. At least for Italian offerings last year we had Bottega Veneta…. Ah yes you are right, I forgot about this one! It was lovely, just not for me still. I’ll keep my fingers crossed for next year, then! I’m curious to know Angela whether, through it all, you still like the opening of Innamorata? You do make it seem very nice. Was your ‘smell palate’ (as I like to think of it) tinged with something else you had just smelled? Or were you just crazy? I think I have to go with the “crazy” verdict. Innamorata’s top notes aren’t very alluring to me now–they’re high pitched and tinged with calone. It must be something pumped in Nordstrom’s air that had me excited. I never though of Kenzo Flower turning to bacon fat! Could be kind of a nice brunch fragrance, though. Some vanillas do that bacon fat thing on me. Sad. Yes, sad. But kind of funny (ha ha funny, sadly), too. No worries Marjorie Rose: there’s lots of other fish in the sea, and perfumes on the fragrance floor! I like the smell of bacon as it’s cooking. It’s the left over smell the pan that is what I get from Flower. Also maybe Annick Goutal’s Vanille Exquise, but not so much. Maybe it has something to do with the smoky aspect that vanilla sometimes has? My brain, or skin, accentuate that sometimes, it would seem. Too bad about the actual fragrance because I love the name. Although to me, it sounds like it should herald a very ‘baroque’, rounded sensual, tactile fragrance which this, it sounds, is decidedly not. Oh my gosh, Fran Drescher is perfect! That’s exactly it! Some perfumes are just too unremitting. These tend to be perfumes that lack evolution, although there are some perfumes that don’t change very much that I like, such as Diptyque L’Ombre dans L’Eau. Unremitting also means monolithic to me. In contrast, the perfumes I prefer have layers of notes; they are not simple. PG Brulure de Rose smells good but wears on me after a while, and the unnatural smoothness and opacity of Prada Infusion d’Iris detracts from its pleasantness, to my nose. I know just what you mean. It sounds like they simply wear you down. If I like the fragrance, I don’t mind if it doesn’t evolve much, but there’s something really wonderful about a perfume that twists and turns. Holy nails on chalkboard screech!!! The sick part is that now I have to try this to smell what it was that was so offensive. My most recent OH NO NEVER LET IT TOUCH ME AGAIN scent was Florabotanica. It was pleasant enough sprayed on the test strip. I tried it on me last week using my spray and walk into it method and I just about passed out. It smelled like leftover strong-smelling shampoo that was not rinsed well. I don’t know which note did not agree with me. The other note that I despise is lily of the valley. To me, it smells like someone with body odor who just threw up. I’m sorry if this sounds gross but this is how I feel about lily of the valley. Yikes about the lily of the valley! Do you even like its scent in the actual flower? You’re reminding me that I need a decant of Violet Blonde! I like it, it’s pretty on me. Nothing spectacular, but breezy and pretty. I don’t get any of the sharpness (I’m usually easily annoyed by that.) Also, I like Viva La Juicy by Juicy Couture, so I must be either anosmic or tacky as heck. I may be a bit cray cray owning those alongside stuff like Serge Lutens, Guerlain exclusives, Maison Francis Kurkdjian or Parfumerie Generale. Hey, you shake it up! That’s good! I usually am on the side of agreeing with all of what you say Mon Angel Angela. Though from the sample i smelled… I had not nearly the same reaction… I find Innamorata Charmingly Pleasant and rather Romantic. I Like it a lot in fact…. I Don’t ever have that reaction of a fragrance hitting to high a register where it makes my head ping… except, beautifully enough, Elie Saab, but that burns with such a EXQUISITE Radiance that it’s almost Masochistically Enjoyable! Usually… I just find myself Sickened by a swimmy wooziness that Florabotainca INSTANTLY bought to the fore! THAT IS TERRIBLE! UGH! STAY AWAY! as for Signorina (LOVED LOVED LOVED IT!) and Valentina (TRIPLE THE LOVE!) i found them both GORGEOUS! and This might reach that height as well the more i get to know it… SO. in conclusion… i have to say that i respectfully disagree with your review and still love your passion and intensity! Love To You, Mon Angel! I was almost going to mention Elie Saab, as that is the most high pitched perfume I know. I don’t like it, and yet I sort of get why people would. Your description ‘radiant’ is a good way of putting it. In the end, tho’, I just have to look away. It is too much, too bright. I have tried the EDT version of Elie Saab, which I like much better. It is more spacious and less dense, to my nose, than the EDP. Lovely citrus opening too. Elie Saab is so shrill that it’s thrilling, like skydiving, I’d imagine. And yes, it feels radiant, too. I welcome your differing opinion! I”m glad you shared it here, too, so that people know there are different views on Innamorata, and they should try it themselves. I just wanted to say that I LOVED your post today – it made me laugh, it made me sigh, it made me talk back to the screen, and it made me go searching for the ‘Like’ button several times. I know exactly what you mean when you say, “it’s the perfume that mimics bees loose in your skull, trying to escape through your nasal passages.” I most often imagine a hot day in summer when the circada buzz gets so loud you think your head will explode… and then they’re gone. Those super screechy perfume notes that seem relentless until they peter out completely, and the worst ones add fruity into the mix. So many things to love about this post. Why can’t someone make a perfume that catches the “moment of a good blog post that makes you laugh with delight? ” Where’s that perfume? Oh my gosh! Thank you so much! I’m really glad you enjoyed the post. What makes a perfume annoying? Like a child on a piano hitting a single note repeatedly and without variation in volume, touch, sustain. That’s annoying. An example: V&A Midnight in Paris, with the tonka that just won’t die. Relentless for hours, the only evolution this note has is that it begins to smack of Raid hornet killer. High register: I agree here, too. I love, LOVE Rien, but the initial aldehyde assault seems to have some lingering effect on my olfactory apparatus. No one quite understands perseveration in fragrance. Does the molecule actually remain for a long residence time on your receptors? Or is your smeller stuck in a feedback loop from overuse (perseveration, where the response is far in excess of the initial stimulus in duration)? Rien has this effect on me. But it’s great stuff, and if you don’t wash you can smell of it for two days (thank you, Antoine Lie!). Also annoying: a certain transparency. If I can see my way clear to the drydown in the first 5 minutes, no matter the duration of the fragrance, that’s annoying. Save me some for later! Wow me with a surprise at 3 hours. Maybe I’m just smelling my way through things too quickly, or it’s a touch of exoticism where I fetishize the novel over the simply lovely. Keep the curtain drawn longer. It is possible to prolong the mystery (PdN’s Odalisque is/was a nice example). For those who can wait, Secretions saves some love as well. L’Instant pour homme does not: much as I love the end, it comes too soon. All those traits I find annoying. Oh, and things that simply die after 5 minutes. That just feels like a ripoff. What a terrific analysis! I hadn’t thought of perfumes with such a light hand on top and heart notes that the base is the major player almost right away. That definitely can be annoying. I think a perfume becomes annoying when it is poorly composed, i.e. the notes don’t blend together well (a hallmark of a fragrance that’s cheaply made, even if they make you pay big bucks for it). In these perfumes there is always a note that asserts itself (one you don’t like) and bludgeons you for hours until you can scrub it off or it finally fades. On the other hand, a well-made fragrance can contain a note or notes you don’t usually like, but they are blended so that they become a seamless part of the whole. Sometimes that hole pops up as certain notes burn off and the fragrance transitions, I’ve noticed. It’s too bad!